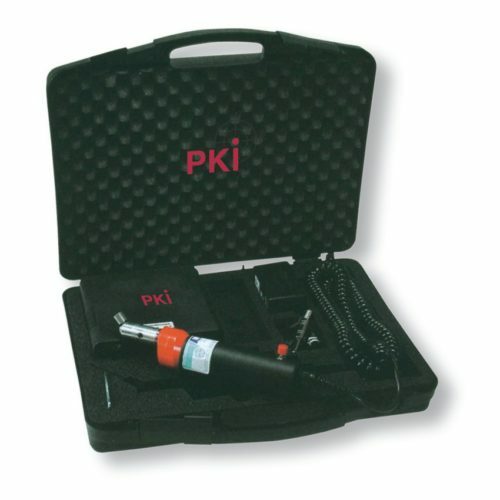 This door opening kit works with up to 44.000 vibrations per minute. Even locks with more than 20 tumblers on several locking sections can be opened within seconds. The frequency of the strokes can be adjusted continuously. The power supply is guaranteed by means of a built-in battery. Most of the opening kits of our competitors destroy the door lock which is of course acceptable in case of an emergency. However, such tools cannot be used for surveillance operations. PKI 9590 can be used in order to open and relock all current available key cylinders without damaging them at all. This is imperative for all kind of room surveillance. The PKI 9590 works in such a way that a special pick is inserted into the locking canal of the key cylinder. The pick is then put into extremely high vibrations which are transferred at the correct angle to the locking bolts of the key cylinder. The locking bolts put into such a vibration fall into their corresponding locking positions and such enabling the core of the key cylinder to rotate freely as if it was opened by using a matching key.